The item Brothers in gray, (electronic resource) represents a specific, individual, material embodiment of a distinct intellectual or artistic creation found in Austin Public Library. 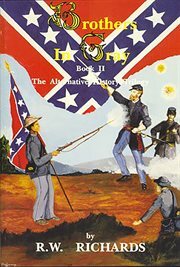 The Alternative History Trilogy opened with A Southern Yarn in which R. W. Richards forged new ground in the field of historical fiction. Using a little known trap set by Lee for Grant along the North Anna River, the Yarn reverses the outcome of the War Between the States. The South achieves independence but yields on the issue of slavery. Now comes Book II of the Trilogy, Brothers in Gray, prequel to the Yarn and every bit as unique. This is the first contemporary novel to spotlight the significant contribution of Black Confederate soldiers throughout the War. Here you'll trace the adventures of two young Virginians, one white, the other black, as they go off to War with Stonewall Jackson. Follow the Army of Northern Virginia as it fights its way through the battles of Second Manassas, South Mountain and Sharpsburg (Antietam)!